Stars: James McAvoy, Bruce Willis, Samuel L. Jackson, Anya Taylor-Joy, Sarah Paulson, Spencer Treat Clark, Charlayne Woodard. The first act of the film is superb with some terrific action sequences and has the viewer checking in on Kevin Wendell Crumb/The Horde (James McAvoy) and David Dunn (Bruce Willis), and their activities since we last saw them. The Horde is up to their usual schizophrenic kidnapping ways and Dunn has become a vigilante over the past 15 years following the events of Unbreakable. It’s a really strong setup and tonally feels like a direct continuation of Split. It also contains the vast majority of Willis’ screen time. Be warned, however, that the first third of the film is probably what an overwhelming number of viewers will be expecting and/or wanting to see in this film and therefore, if that’s the only reason why you’re here, then enjoy it while it lasts! 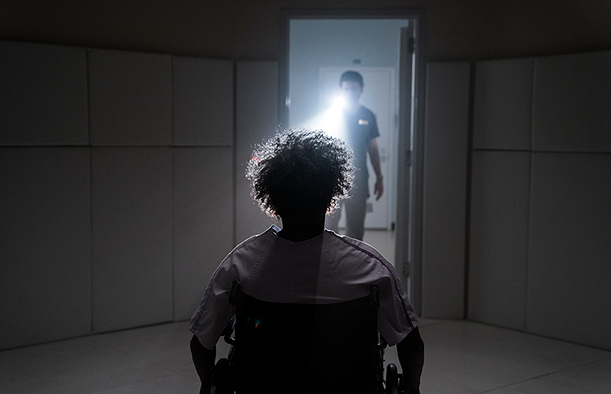 After this thrilling opening sequence which flies by, the film relocates to a hospital for the middle act which is very heavy on dialogue, exposition and is positively snail-paced. 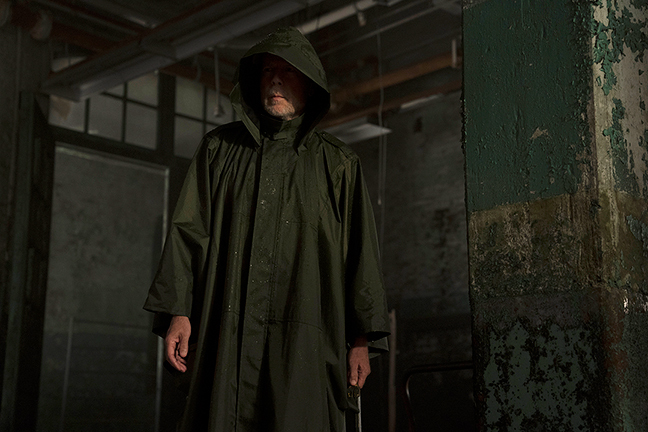 Having said that, it matches the tone and pace of Unbreakable, and depending on how you feel about that film, it will either be compelling or an absolute snooze-fest (for the record, I fall into the former camp). 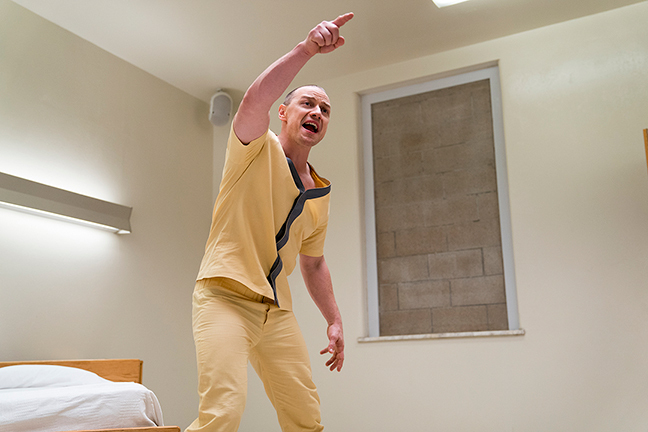 This second act reminded me of Silence Of The Lambs, possibly because it’s based in a claustrophobic prison cell/psychiatric ward and the vast majority of scenes are made up of two characters talking in a confined space. 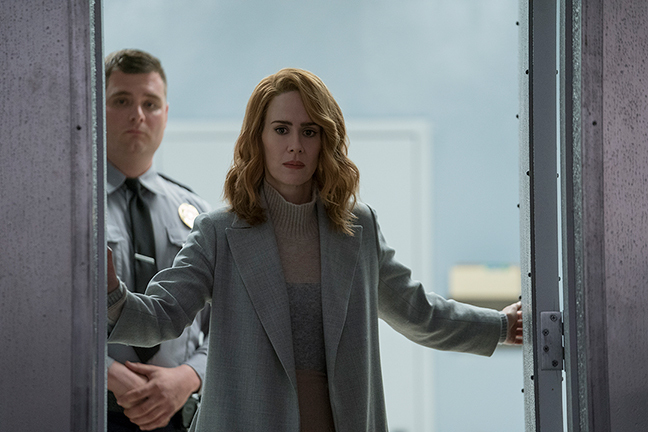 It introduces some new characters, including Ellie Staple (Sarah Paulson), an extremely cynical doctor whom is unconvinced about our three leads’ ‘gifts’ (does Marvel Comics own the copyright to the words ‘super powers’ or something?) and believes them all to be “suffering from delusions of grandeur”. There’s a very meta-textual monologue that Staples makes during the film that demeans and degrades comics and the people that read them (in short, “comics are for kids!”) which acts as a counterpoint to Elijah Price’s Unbreakable speech about comics being a form of storytelling, historical record or simply passing knowledge down from generation to generation. It’s well-handled, because you can feel the dichotomy between Paulson’s character speaking the lines and the metaphorical winks from the writer/director who clearly doesn’t put comics on a lower rung to other art forms like his character does. After two very promising opening acts, we reach the third and final act and this is where things take a turn for the worse. After some prison break scenes that might not have felt out of place in The Great Escape, the quality of the screenplay suffers a serious drop. There are the obligatory Shyamalan plot twists that are either signposted a hundred miles away or seem entirely random and shoehorned in because he simply didn’t know how he wanted to end the movie. This is a pretty big failing in the final part of a trilogy that’s been nearly 20 years in the making. There’s also a couple of moments that imply the conclusion would be like a reworking of the finale of King Kong, and when the film doesn’t head in that direction, I ended up feeling frustrated and more than a little cheated. It’s an uneven and ultimately disappointing final act – while I freely admit I was satisfied where the film leaves most of the assembled cast, I was disappointed by how they got to their respective conclusions. There’s also too many ‘lucky coincidences’ – sometimes characters show up in the same place at the same time for, I don’t know, ‘reasons’?– and there’s at least two out of three scenes set in a comic book store that don’t really have much justification for being in the film. The final 20 or 30 minutes felt far too rushed, particularly after the slow burn of the mid-section, and in a frantic attempt to try and tie up all the loose ends, it results in scenes where some of the characters do things that are utterly illogical or they behave completely out of character. It must be emphasised that this is not the fault of the actors and primarily a failing within Shyamalan’s sometimes clunky script that leads to some truly ridiculous moments. The leads are all on top form. Bruce Willis is good with what he is given but frankly, he doesn’t get anywhere near enough screen time, being completely sidelined after the first act. Jackson, (as previously mentioned) is strangely absent from proceedings for the whole of that first section, and comes across as a scheming Lex Luthor in a wheelchair, while McAvoy once again is truly amazing. Thought he was good in “Split”? Sure, but he’s refined his performance since then and he steals the show once more. He gives an acting master class, completely unhinged and flitting between the cute, the hilarious and the genuinely terrifying, with seeming ease. If after reading my review you are dissuaded from going to watch this movie, I’d urge you to reconsider because it’s worth the ticket price alone for James McAvoy’s various ‘roles’. There are some nice interactions between Mr Glass and Kevin. A particular favourite of mine here is a sequence involving some floodlights which trigger a different alter ego within Kevin with every subsequent flash. Effortlessly, McAvoy switches between his 20+ personalities, some of the 8 previously seen are here as well as a good handful of new ones….Jade and Mr Pritchard are two of my new favourites. The supporting cast give solid if not downright excellent performances. The film is very well shot and special kudos should be given to Shyamalan for providing each of the film’s leads with their own individual colour palette which makes the scene transitions much easier to follow. The action sequences are great and I’m very pleased it never really descends into standard Marvel fare as we get at least two of those movies a year already. There’s also at least one scene that’s basically a deleted scene from Unbreakable and it was well-incorporated into the film. The soundtrack by West Dylan Thordson, the same composer he used on Split, is pretty similar to the nails-on-blackboard scraping and bowed double bass wrenching of this film’s predecessor. It’s OK but nowhere nearly as memorable as James Newton Howard’s Unbreakable score, which thankfully we get the occasional flourish here or themes taken from it whenever we are treated to a David Dunn moment. It’s a much-underrated score and it’s nice to be reminded of it again. All in all, this was an enjoyable film and it’s absolutely worth a watch but is clearly the weakest entry in the trilogy. I feel this movie will go the way of The Last Jedi – there will be fans debating it; defending and slating it in equal measure for the foreseeable future and, if it weren’t for the last half an hour of the film, then I don’t think there would be any question about its overall quality. Go in with high expectations, you will most likely be disappointed but if you go in with low or indeed no expectations, I think you’ll be pleasantly surprised. 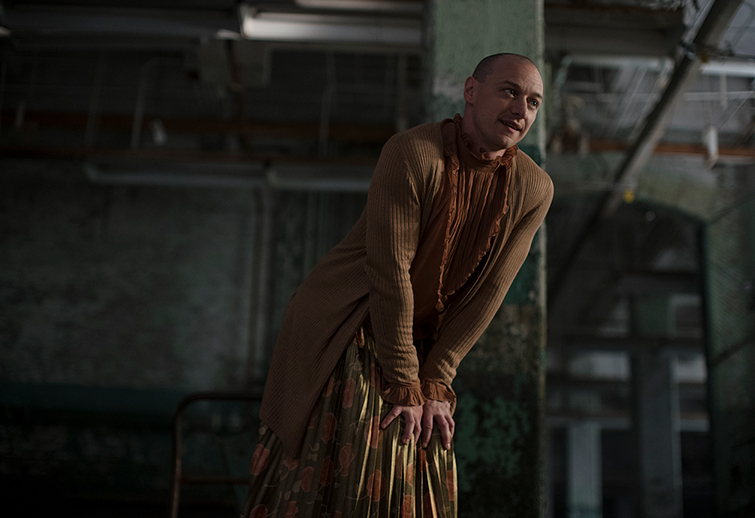 Glass is out from today in cinemas in the UK and US.